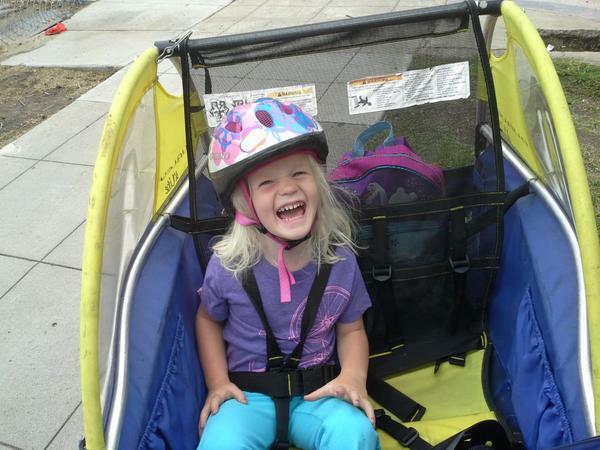 Pictured: BikeSD board member, John Anderson’s daughter. He tweeted, “This is my kid, we bike to school together. We’re not flipping people off or yelling, [we] just want to get there safely.” Commenters at the Union Tribune (UT) remain unconvinced. BikeSD board member, Nicole Burgess was successful in obtaining funds to stripe a crosswalk, a project that has been in the works for seven years. Mayor Faculconer has released his draft climate action plan. It sets a laudable goal of 18% bike mode share by 2035. In Uptown news, Walt Chambers, extols Jim Frost’s alternative to SANDAG’s University Avenue plan that seems to make everyone happy. We are awaiting SANDAG’s analysis of Frost’s proposal. Voice of San Diego’s Matthew Hose writes about the city’s newest committee, the Bicycle Advisory Committee. Meetings are held every first Wednesday of the month at 6PM. More information is available here. Fiesta Island now has new signage after the recent wrong way driving crash that seriously injured several San Diego Bike Club riders. Perhaps the city could consider banning cars from the park instead? Will San Diegan advocates succeed in advocating for the building of the city’s first bike park? Perhaps, because the city certainly doesn’t seem to take it kindly to any initiative shown by residents themselves. Interested in an overview of city planning? Our noted local code wrangler, Howard Blackson, has you covered. A hit-and-run driver struck a woman walking in the bike lane on Gilman Drive. Pacific Beach will have the most bike share stations. This has caused some residents to feel “disenfranchised”, according to interim Councilmember Ed Harris. A third network scenario pitched by Circulate SD and others, seems to have garnered SANDAG’s interest. University of San Diego is urging its students to bike to class. The next CicloSDias will be held in Hillcrest in November by the San Diego County Bicycle Coalition, who seemed to have dropped the word “county” from their name. The San Diego Tourism people are encouraging tourists to consider exploring our city by bicycle. A SDPD officer responding to a domestic violence call was struck by a car and then struck eight tourists riding on the sidewalk. Hostelling International has announced their annual Christmas Bike Trip details. San Diego County Bicycle Coalition board member, Kerry Kunsman, was hit from behind and killed on a tour in Oregon. The San Diego Free Press highlights vision zero, a program that is gaining ground in the U.S. to eliminate all traffic deaths. Perhaps the Free Press’ counterpart, SD Rostra could write about how not having people die on our streets would help our local economy and improve our quality of life? Coronado’s police have been successful at catching bike thieves. Have a gently used bicycle you’d like to donate? You can do so and make Encinitas’ 32nd Annual Holiday Baskets event a great success. A nine year old is riding across the country to raise money for children suffering from cancer. Another nine year old tested his freedom by riding his bike from Imperial Beach to Coronado. UT-s Derrick Evens has realized that riding a bicycle is not just for kids…in Coronado. Cyclist found dead following apparent hit-and-run in Oceanside. His family is raising funds to aid with funeral costs. A truck driver struck a cyclist in Chula Vista and killed him. The three-foot bill is now law. We are raising funds to make sure this message gets posted city-wide. Make a tax-deductible donation to see that happen. See our homepage for a mockup of the ad (still subject to editing). A small fee on vehicle registrations will pay for bike infrastructure. It’s cheaper to fix LA’s roads (and San Diego’s) than to keep fixing the damage they cause our cars. A lot cheaper. We don’t miss former USDOT Secretary Ray LaHood so much anymore. Anthony Foxx is starting to lay the groundwork for transformative change in the nation’s transportation system. More here. Dan Walters from the Sacramento Bee spouted off nonsense which was happily reprinted by the UT. Streetsblog’s Melanie Curry wrote an excellent rebuttal. Maybe all the bikelash is a good thing? A former San Diego resident calls San Diego “a city of freeways” and finds commuting by bicycle in Madison, Wisconsin much more convenient. Can you fight bike theft? Yes. Do cars take up valuable public space? Yes. A Norwegian town is paying people to bike and walk. Chip Sanders will be back soon. Woman was walking northbound on Gilman Drive. It’s been edited. Thank you.